This article is for IT admins managing the OneDrive sync client in a Windows Server enterprise environment that uses Active Directory Domain Services. Your users can continue using the folders they're familiar with. They don't have to change their daily work habits to save files to OneDrive. Saving files to OneDrive backs up your users' data in the cloud and gives them access to their files from any device. 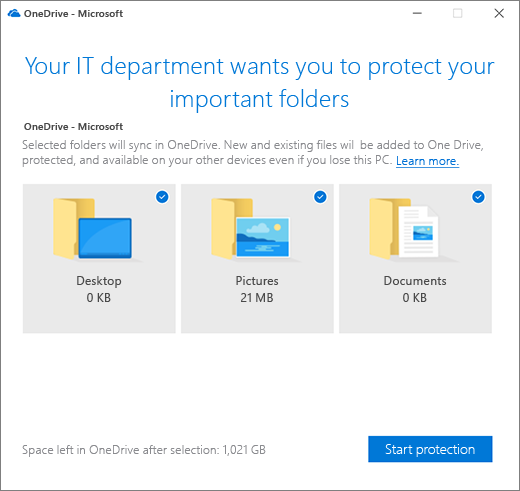 For these reasons, we recommend moving or redirecting known folders to OneDrive if you're an enterprise or large organization. Small or medium businesses may also find this useful, but keep in mind you'll need some experience with Group Policy. 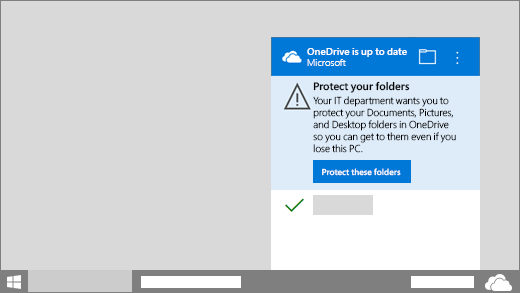 For info about the end-user experience, see Protect your files by saving them to OneDrive. To use the following Group Policy objects, you need the OneDrive sync build 18.111.0603.0004 or later. You can see your build number in the About tab in OneDrive settings. We recommend upgrading to the latest available build before deploying to decrease deployment issues. Known Folder Move does not work for users syncing OneDrive files in SharePoint Server. The OneDrive Known Folder Move Group Policy objects won't work if you previously used Windows Folder Redirection Group Policy objects to redirect the Documents, Pictures, or Desktop folders to a location other than OneDrive. Remove the Windows Group Policy objects for these folders before you enable the OneDrive Group Policy objects. The OneDrive Group Policy objects won't affect the Music and Videos folders, so you can keep them redirected with the Windows Group Policy objects. For info about Windows Folder Redirection, see Deploy Folder Redirection with Offline Files. If your organization is large and your users have a lot of files in their known folders, make sure you roll out the Group Policy objects slowly to minimize the network impact of uploading files. For users who have a lot of files in their known folders, consider using the policy "Limit the sync client upload rate to a percentage of throughput" temporarily if you would like to minimize the network impact and then disable the policy once uploads are complete. If users have OneNote notebooks in their known folders, the known folders won't be moved. For guidance on moving OneNote notebooks to OneDrive, see Move a OneNote notebook to OneDrive. Use this setting to give the users a call to action to move their Windows known folders. If users dismiss the prompt, a reminder notification will appear in the activity center until they move all known folders. If a user has already redirected their known folders to a different OneDrive account, they'll be prompted to direct the folders to the account for your organization (leaving existing files behind). Use this setting to redirect known folders to OneDrive without any user interaction. Before sync client build 18.171.0823.0001, this setting redirected only empty known folders to OneDrive. Now, it redirects known folders that contain content and moves the content to OneDrive. You can choose to display a notification to users after their folders have been redirected. A known folder contains an Outlook database file (.pst), or a OneNote file that isn't already stored in OneDrive. A known folder is on a different volume than the OneDrive folder. For info about these errors, see Fix problems with folder protection. We recommend using this setting together with "Prompt users to move Windows known folders to OneDrive." If moving the known folders silently does not succeed, users will be prompted to correct the error and continue. Use this setting to force users to keep their known folders directed to OneDrive. Users can direct their known folders by opening OneDrive sync client settings, clicking the AutoSave tab, and then clicking Update folders. For info about using the OneDrive Group Policy objects, see Use Group Policy to control OneDrive sync client settings.